Our motto is: "We serve with a smile". This not only leads to satisfied customers, it also makes for motivated staff. 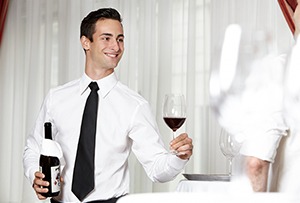 Because only satisfied personnel are capable of delivering the best service. And even in stressful gastronomy work, first-rate staff is always sought after. Only top people guarantee top service! Our gastro staff impress with their high-quality work. Our staff complete sound, needs-based training at our easystaff academy that meets all your high-quality standards in every instance. 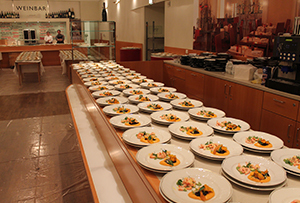 You're guests will receive the best – a completely successful event. Even the hotel or hospitality industry can suffer from lack of personnel due to peak times, holidays or illness. With easystaff as your partner, you'll have a huge pool of staff available – thus closing any personnel gaps quickly and competently. We'll advise you professionally from the very first second and help you to find the specialist staff you require. It doesn't matter if it's by the hour or for a longer period of time. Whether service personnel, logistics specialists or kitchen assistants – a first-class project manager is always there! Friendly, reliable, competent and motivated! That's how our gastronomy personnel present themselves. 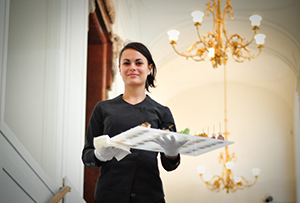 easystaff has the perfect personnel solution for your gastro business or event on hand. 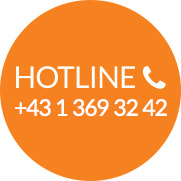 Profit from our excellent project management both in the event industry and for outsourcing solutions. A project manager that is solely responsibly for you guarantees the punctual appointment of the service staff you require and ensures your commission is executed smoothly. You'll get various kinds of top-quality catering personal from us as support for your event. This has three crucial advantages for you: Firstly: You'll increase your present quality. Secondly: You'll reduce your fixed costs. Thirdly and most importantly: Your guests will be delighted by your event. Our sensational project managers ensure smooth execution. Let us do the work so that you can enjoy your party! Our professionally trained logistics specialists will be at your side so that the back office runs smoothly and for both during the event and for setting up and dismantling before and after the actual event. From loading equipment and handling goods through to setting up the location and managing deliveries – our easystaff logistics specialists are completely motivated and are ready to pitch in at any time. This will also make your event a complete success behind the scenes. I AM BEYOND THRILLED & have to have those exact 3 at our next event. Helpful, independet thinkers, friendly, solution oriented, constantly smiling, respectful & tidy. You have really great people & your selection was excellent. Thank you very much! As soon as we have our next even, we will give you a call! As always, the ladies and gentlemen were wonderful and did an amazing job to make the event something very special. THANK YOU! "Our party was a complete success. Thanks to the support of your staff, our spectacle ran like clockwork. The support given by the service staff was praised by the guests. Thank you!" "We are happy to recommend easystaff service staff due to their consistently professional and discreet appearance at diplomatic receptions. A big advantage is the staff's linguistic diversity. Keep it up!" "We're pleased to have found a competent partner in easystaff and will continue to build on your flexible support. It's a joy to be able to work with such a friendly and motivated team – thank you"
"The issue of finding good staff is becoming ever more demanding… The Hospitality Industry needs young motivated people who receive “on the job” training We are pleased to be working with professionals like “easystaff” Reliable and Flexible"
"We like working with easystaff at our events. The staff excel at being friendly and professionally competent. We are therefore able to offer our customers the best quality in all areas." 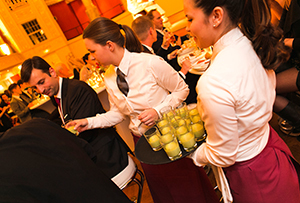 "easystaff has been a dependable and valuable partner to us at numerous catering events at the Viennese Concert Hall – standing receptions, multi-course gala menus and buffets for up to 2000 people. The well-trained and above all neat and very friendly service staff contribute to the fact that we have satisfied customers and guests than like to keep coming back". Or you perhaps want to become and part of our team as an active easystaffer?